Last night we moved the clocks back to Standard Time. As I write, it's nearing 5 pm and darkness begins to cloak the landscape. Trees toss their branches, littering streets and gardens with leaves in golden shades. Soon we'll close the curtains and withdraw into coziness. Over the past day or two a Pineapple Express from the South Pacific blew through bringing heavy rain, wind, and warm temperatures. In my garden roses continue to bud and bloom, although the full flowers droop under the weight of rain. The pink dahlias produce enough flowers for me to clip a small bouquet each week. Yesterday I discovered a few raspberries, not as sweet as summer's fruit, but still "very tasty" according to a six-year-old who spent the night and enjoyed the berries with her breakfast. This hydrangea blossom clearly misunderstood the memo about November. She looks a little uncertain and young alongside the mature and weathered blooms. After a very wet night the sun streamed into the living room this morning. I like a tray on the coffee table for corralling things like coasters, pencils, and remotes. A tray is easy to pick up and move elsewhere if the table is needed for drawing, playing a game, or other important tasks. This afternoon we celebrated three birthdays that occur within two weeks. Our son made the cake and I wish I'd taken a picture of a cut slice. He made a Russian Honey Cake, composed of 8 thin layers that have a taste similar to graham wafers and a whipped cream/sour cream filling and icing. It was delicious! We had the doors and windows open for much of the afternoon and all went for a walk around 2:30. Nine of us climbed Christmas Hill from where the city spreads all around to the Sooke Hills in the west and to the ocean to the south and east. with all the wonder of a child. The woods were polka-dotted still with leaves clinging to branches, like gold coins among brown twigs. Soon, however, the wind and rain will strip the branches bare and the stark architecture of nature will be revealed. 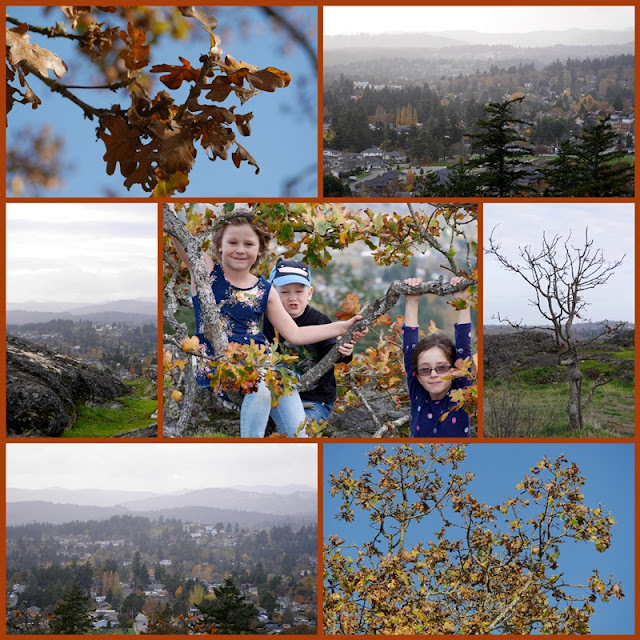 Linking with Mosaic Monday, where we have a new host, Angie of Letting Go of the Bay Leaf. Thank you to Maggie, who hosted #157 weeks of Mosaic Monday, and a thank you to Angie for taking up the challenge. You still have pretty color shown in that mosaic. Happy Birthday and how special that your son made that cake! Looks like November is starting well for you! Such a beautiful day and a beautiful post today. I’m still grinning over the description of “polka-dotted woods.” So November is your birthday and a daughter’s birthday and your daughter-in-law’s as well? That cake sounds delightful. As the mother of two boys, I am most impressed that your son made the birthday cake. I can't imagine such a thing :). It sure does look pretty and sound yummy. Happy Birthday to all 3 of you. Happy Birthday! Those leaves will disappear with the next stormy day. That cake looks and sounds incredible! Will your son share the recipe? Happy combined birthday to your family members. I'm amazed you still have so many flowers in bloom there! The photo of you birthday girls blowing candles is so cute and your post full of praise and gratitude to family and grandchildren <3 Me and my husband have together nine grandchildren at very different ages, a bless in life! Happy MM. What a wonderful celebration cake! Isn't it cheering to see those last little bits of colour in the garden. I love the way that the younger generation of fathers make cake and that one sounds and looks delicious. My granddaughters recently encouraged my husband to make cake, and though he just makes ordinary sponges - chocolate, or vanilla, it is certainly a big step in the right direction. I had not heard that weather expression 'a Pineapple Express', but looked it up on google and now understand more about it. That cake sounds delicious---a lot of work but well worth it in the end! I love that you were able to spend so much family time together. The kids grow up so fast and family time is so important. Such a beautiful mosaic today, I have never come across the phrase/expression Pineapple Express either. That is why I love the blogging world you learn something new all the time. Sounds like you are settling into November just perfectly! Your beautiful mosaic is especially welcome this morning. In the last few days all color from our homestead has disappeared. Not a flower in sight. It will be dreary scenery around here until the snow begins to fall. Lovely photos and words as always! The trees here are being stripped bare by winds and rain. We had a late turning, color wise, and its sad to see them falling so quickly. They were, however, stunning this year! I'm storing the beauty up in my heart and mind to remember during the winter! Happy Birthday to you all! The cake sound amazing! 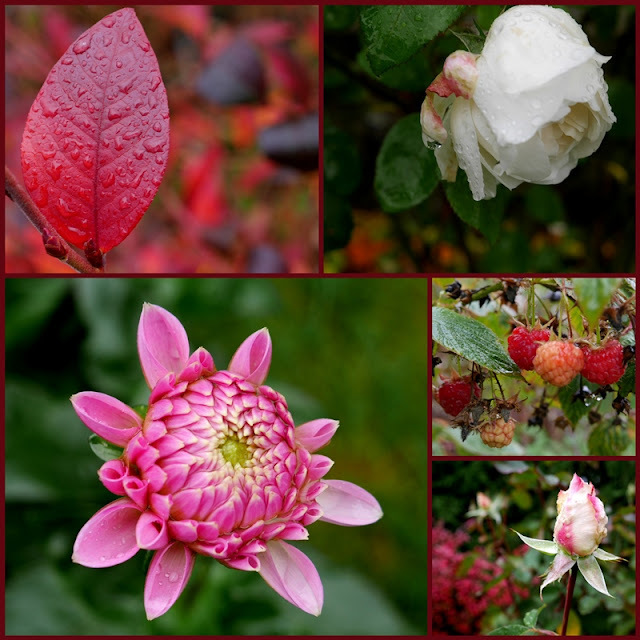 Love your beautiful photos for Fall! It's dark early here now too. If I can just keep getting up a little earlier....lol! Happy MM! Birthday blessings to you three November gals! Wow . . . that cakes sounds fabulous! Lovely, as usual, such a joyous celebration of family and home. Birthday greetings to the three of you (we have birthday clusters in our family as well, March, November, and July). And thanks for the reminder about the value of a tray -- I look at my coffee table right now, strewn with books and knitting (all My Bad) and I wonder why I haven't been using a tray lately. I'm going to corral the creative clutter on a tray as soon as I finish writing this comment. Lovely photographs again Lorrie and those words from Edna Jaques are just right! November is off to a beautiful start around your home (and in it). Same thing is true here (well, maybe not *in* it, since we just moved ... but definitely around.) Such a gift to have sunny days in between those PNW showers. And especially nice when you have good weather on days when family is visiting. That cake sounds incredible! Happy Birthday (I'm fairly sure i recognize you as one of the candle snuffers). The cake sounds and looks delicious! Happy birthday. The weather has been lovely and your description and photos are particularly cheerful. Like mater I am thinking of organizing my cluttered coffee table with a tray! Great inspiration Lorrie! I'm intrigued by the yummy Russian Honey Cake. We're also getting some rain here--I didn't realize that this wet weather was due to the Pineapple Express. I do believe we are having similar weather. My calla lilies are coming up and unfurling their leaves. The cake looks yummy. Wow! raspberries! We did just finish picking the last of the figs. I love the idea of the tray to corral things on the table. I think I need to do that right this very minute. Thanks for the idea! Lorrie - thanks for gracing my first MM with your fine mosaics and exquisite turn of phrase! I also was unfamiliar with the term Pineapple Express and wondered for a moment if it was your creation!!! It is my sincere wish that kids today will inspire us all to get outside and enjoy nature - I fear that too many prefer otherwise … Belated Happy Birthday to you! Lorrie, Still picking flowers and the windows open. Very cool. We got snow on Friday and I expect it will stay. I thought it would help with attendance at our craft sale on Saturday but no such luck. Great to celebrate with family. Have a great week. Sylvia D.
The Russian Honey cake sounds like a winner to me! It looks amazing. And I do like that quote you shared of Edna Jaques's -- it says it perfectly. Love your phrase "polka-dotted woods". Gorgeous photos! Happy belated birthday to all. Your photos are lovely. The hydrangea are so pretty. The cake looks delicious. I like the idea of using a tray to hold things on the coffee table. The poem is fitting for me, I like going out and enjoying nature and the outdoors. Enjoy your day and week ahead. What wonderful November surprises you've shared, Lorrie! A most Happy Birthday to you and the other two beauties. The cake sounds like such a delight, and how thoughtful of your son to make it. We have quite a few November birthdays as well....three of my grandchildren! I love hearing stories of your family's outings and how you enjoy each other's company. It looks to be a happy (with the family) and beautiful (your climate sounds very interesting) month there. The cake your son made sounds fabulous. Wishing you a wonderful day. Hugs! Lorrie, what a beautiful post! Love that bit of poetry, fits in so well with your own poetic language. Thank you so much for your well wishes last week. I'm getting better every day and actually managed to make an easy recipe for today's post.